Several years ago, for a season, our family used the Bible as our main textbook for one year. You can read all about it in my free ebook, and I also have several posts on this blog about it. We had an amazing year and we learned so much. I am forever grateful for that year because I have seen the changes resulting in my family because we spent so much time in His Word. I remember thinking that our family could only be transformed by spending several hours a day in His Word and I was right. I have seen the results over the years. Even though we do not use the Bible as our main textbook anymore, we still make our family Bible study our priority. We don’t open any books unless we have opened the most important book! The Bible. The results of being in the Word are great. How can we NOT be transformed when we are digging deep into the Word of God? Raising them with God’s Word as their foundation solidifies their identity in Christ and deepens their dependence on God. As they grow they are going to look to others for affirmation, or to their peers. I want them to look to Christ. I want them to be God- dependent and not peer-dependent. When we study the Bible together, we don’t dumb it down. The Holy Spirit is perfectly capable of speaking to our kids, and some of the discussions that have come about from our studies have truly been amazing. Don’t underestimate their understanding of things. I love seeing them learn about God and have “light bulb moments.” We learn so much together! it is truly a blessing. We recently had a fun discussion with my children about the trials of toddlerhood and babyhood that we all endured. We talked about how some of the children have overcome certain issues and how mommy and daddy have overcome certain issues. It was a sweet time of honesty and a testimony to see what God has done in our family. We have replaced much of the yelling (from kids and parents 😉 ) with gentler tones. We have learned to seek what God says about an issue when we used to fight about being right or wrong. We have learned to depend on Him and not ourselves. We have learned to put others first, even when we don’t feel like it. We have learned more self-control and more patience. We have learned what servanthood looks like. We have learned instead of talking about our problems to everyone else, we take it to the Lord first. His answers are sitting right there waiting. We are learning that life isn’t about us. It is about Him. Yes, His Word is bearing fruit. The year we used the Bible as our main textbook was also the year my husband began a family business. Because we had been in the Word so much that year, it helped us to really focus on HIM. When we began the business, we knew we would depend on God for each and every job. There was a complete trust needed, and we were equipped to take that leap of faith because of His Word. God’s Word is not something to be taken lightly. It is the Creator of the universe’s very own words to us! How dare we let it sit on a shelf, untouched. While we know we still have much more to learn on our journey, and we are so far from perfect, I am incredibly grateful to know that God’s Word is faithful. I have seen His power work in my family because we have sought Him above all. He is transforming us as a family. Do not be conformed to this world,[ but be transformed by the renewal of your mind, that by testing you may discern what is the will of God, what is good and acceptable and perfect. May it be so for all of us. That we would not follow this world’s ways, but HIS ways. May we be transformed by His Word. First in our families and then in the world! 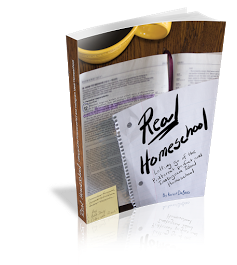 Real Homeschool: Letting Go of the Pinterest-Perfect and Instagram-Ideal Homeschool Available in Paperback or for Kindle! Next Next post: Join Us On A New Adventure!